Today, we’re going to start off with a long-term chart, because I finally feel the time is right to call attention to this particular potential. I often begin tracking potential patterns many months in advance, but don’t mention them in the articles, because I feel it would only confuse people if I discussed these patterns too early. 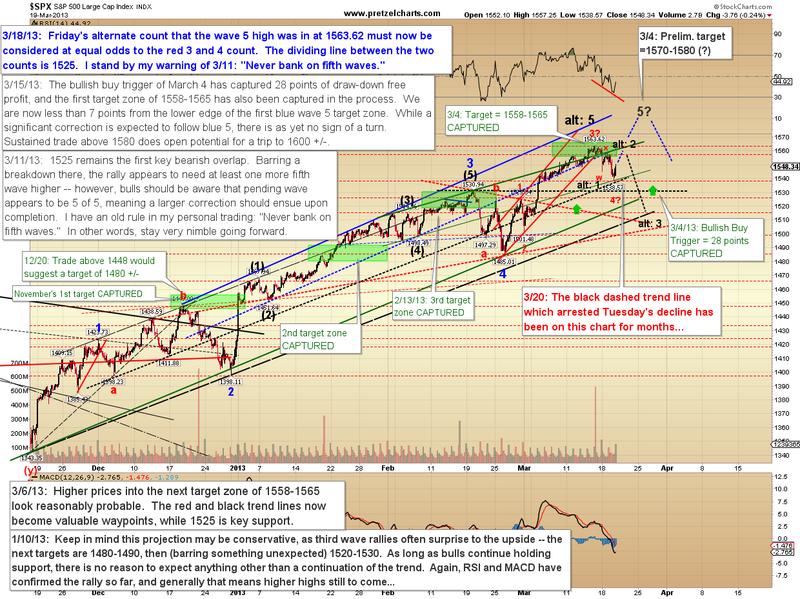 The chart below is one that's been on my watch list for a long time, but the pattern has only now reached a position where I feel I can talk about it without confusing readers. As we all know, bullish sentiment has been extreme, and many major indices have broken, or are probing, their all-time highs. More often than not, this is where the general public finally decides it's time to "put some of our savings into stocks." Usually not long after that happens, the Big Boyz figure out a way to fleece retail investors of most of that money so they can go buy themselves a new Congressperson or two. 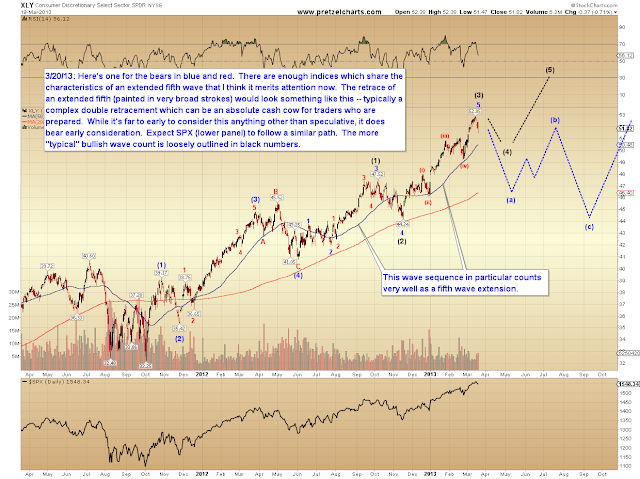 Accordingly, the chart below notes that the wave since June 2012 reconciles quite well as a fifth wave extension (shown in blue), which would actually lead to a significant retracement. Of course, this is way ahead of the game here and should presently be considered as an alternate count -- but I do want readers to be aware that there are indeed more bearish potentials than the ones I've been focusing on recently (shown in black). 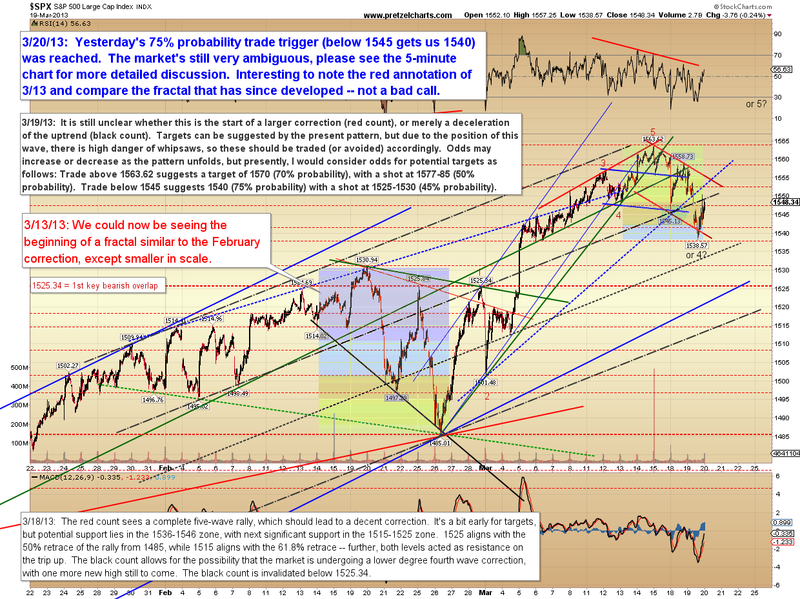 So as always, it's important to avoid getting too complacent if you are bullishly inclined. 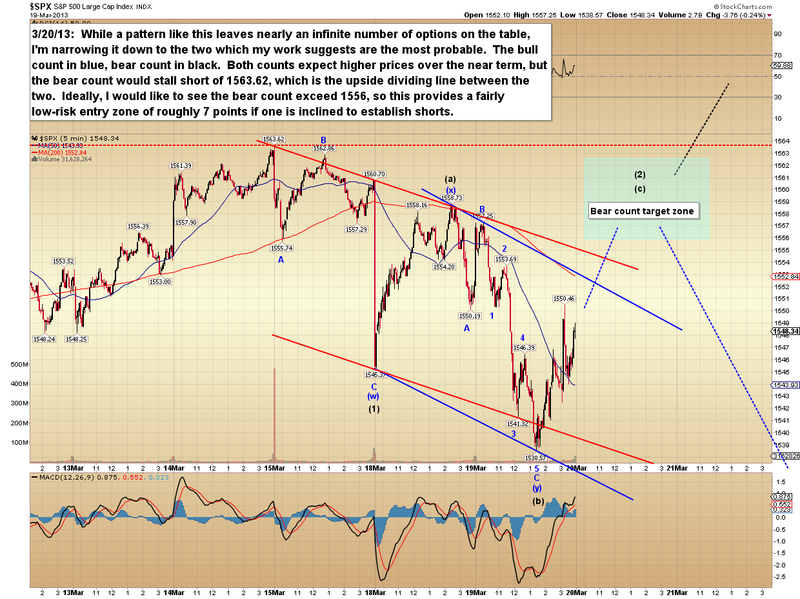 The hourly chart below shows the more bearish count as the alternate, but I am still giving it equal odds at the moment. There are literally infinite possibilities at any given moment, particularly in a structure like this. Nevertheless, I've narrowed the chart below to the two I feel are most probable. When I look at this chart, I am actually somewhat inclined to favor the bears. The 10-minute chart contains additional trend line detail. The similarity in fractals is hard to miss now. 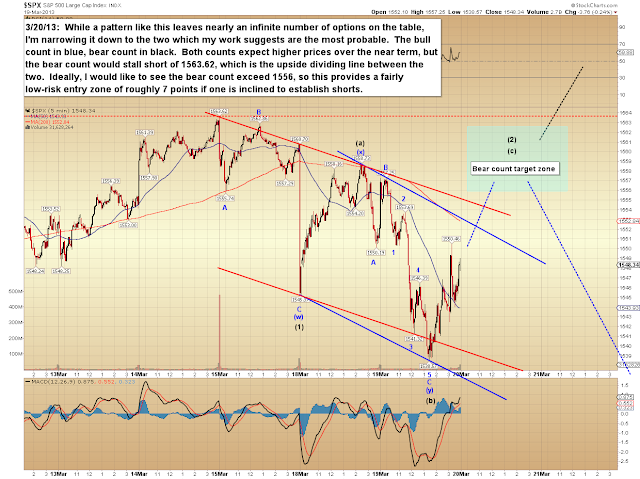 In conclusion, the wave counts may clarify as early as this session. Keep in mind we do have the FOMC announcement today, and that can make for a nutty market. 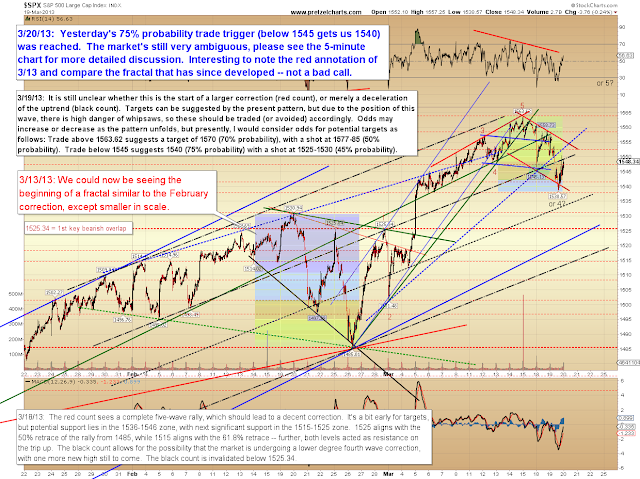 There's no material change in the intermediate outlook, and I presently continue to feel that the market is very close to an intermediate turn. Trade safe. The Beard has spoken again...more status quo. This market action reminds me of the old song by the Fifth Dimension "Up up and away in my beautiful, my beautiful balloon.... Wonder how high this balloon will go?? ?